Why has the spray foam and coatings industry largely relied on a 40 KW or larger generator to power spray rigs and job sites? The main reason is the generator has needed to be over-sized, in order to withstand the voltage in rush when the compressor is cycling on and off. In custom spray rigs at Intech Equipment, the 35 KHV generator and compressor are inline direct coupled, so there is no need to oversize the generator. 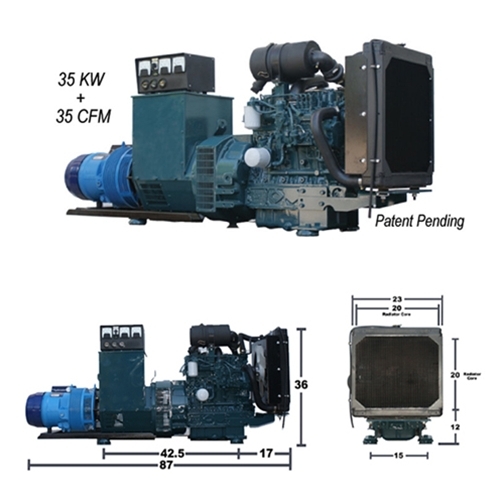 Ideally you want to size your generator to fit your most common applications. That is exactly how we size our generators that we install in custom mobile spray systems. The 35KHV generator offers a space saving design, geared for high production crews concerned about weight constraints in the rig, without the need to sacrifice performance. Order the Kubota All-in-One generator for your jobsite power needs, and keep adequate power supplied, while keeping jobs on schedule and reducing power-related delays. Order at Intech Equipment for service and support from industry experts, with first hand knowledge of the challenges you face every day on the job site. Reduce down time and maximize productivity, without the unnecessary expenses of oversizing a generator. Learn more today! Hydraulic version is available upon request. Please contact us now for more information.